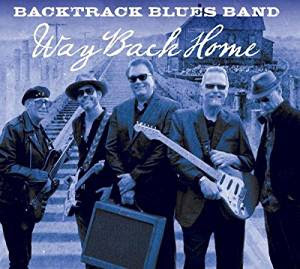 I just had the opportunity to review the newest release, Way Back Home, from the Backtrack Blues Band and it's solid. Opening with Going to Eleuthera, a snappy shuffle, Sonny Charles leads the way on lead vocals and Kid Royal is hot on his heels on lead guitar. Rounding out the troupe is Little Johnny Walter on rhythm guitar, Joe Bencomo on drums and Stick Davis on bass. Victor Wainwright is featured on piano and does a real nice job and Charles really makes his harp sing. Nice opener. On Tell Your Daddy, the band sets a funky dance groove with a boogaloo bass line. Breaking into a smooth shuffle Royal plays it like a stud and the deal is on. Breaking back, Charles brings his harp to the forefront with great tone. Shoot My Rooster has a real nice blues lope with Charles' harp on call and Royal's guitar on response. One of my favorite tracks on the release, this track features super piano work by Wainwright in the mix with Royal and Charles. Excellent. Sonny Boy Williamson's Your Funeral, My Trial really gets the feel of old Chicago blues with Charles working his harp. Royal's Texas blues guitar styling is tight and forceful giving the track great balance. Nobody But You has a bit of 50's R&B blues styling and Royal's guitar work is clean and distinctive. Charles' harp work is fat and rich with tight underpinnings by Wainwright, Davis and Bencomo. On Heavy Built Woman Royal takes a real nice walk on his six string with Funderburgh like runs and Charles' vocals and super harp are nicely backed by Latonya Oliver and Dana Merriwether. Blues classic, Baby Please Don't Go is up next and with great enthusiasm Charles shouts out the lyrics. This track has great instrumental qualities with solid entries by Charles and Royal. Check it out! Rich Man Blues has a real deep lope and strong Chicago blues styling. Royal and Charles take nice solo passes and Wainwright's contributions are essential. Wrapping the release is Help Me Just This Time, a modified boogie. With it's driving bass riff, Wainwright's extensive piano work and Royal and Charles trading riffs, this is a great track to wrap a fun release.